Home Industry Reports Food & Beverage GCC Frozen Bakery Market - Growth, Trends and Forecasts (2018 - 2023). 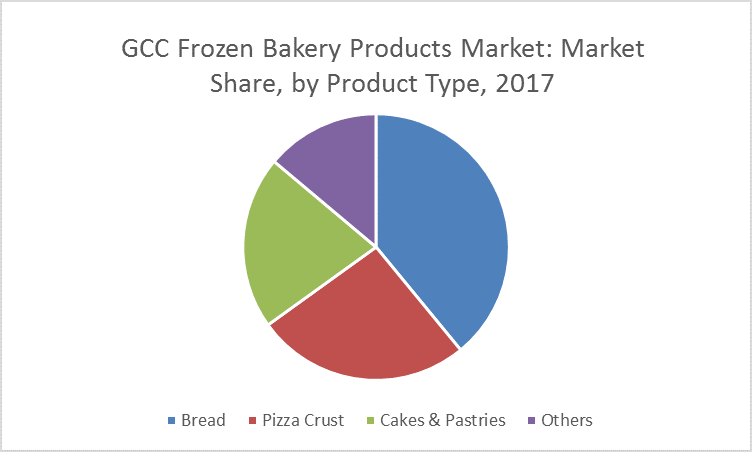 The GCC frozen bakery product market was valued at USD 161.52 million in 2016, and is expected to reach USD 241.14 million by 2022, registering a CAGR of 7.0% during the forecast period (2018-2023). Convenience is the leading driver for the market, due to the growing busy lifestyle in the region. Expanding retail market is giving good opportunity to the international and domestic players in the market. The GCC packaged food market is booming, with rising demand for healthy and international foods, from a growing base of expatriates as well as young consumers. Saudi Arabia is home to one of the largest young populaces, who form the main consumers of bakery products. Consequently, it is resulting in an ever-increasing demand for the frozen bakery products to satisfy the growing demand. Due to its ease of access and the availability of pre-baked products in the form of frozen goods, bread is the most consumed bakery product in the GCC region. Countries, such as Kuwait, UAE, and Qatar represent the wealthiest and busiest nations of the world. Therefore, consumers prefer to consume ready-to-eat products. The domestic market for frozen bakery goods in GCC is not well established, and the region is currently importing the goods. Thus, the domestic market is unexplored, and presents an opportunity for multinational companies to enter the domestic market, with the concept of private labels, to exploit the market. Modern retail formats of hypermarkets and supermarkets are gaining popularity among busy consumers in the GCC, thus providing a platform for multinational brands to market their frozen bakery products. Frozen bread occupies a major share of 39.14% in the GCC frozen bakery market, followed by frozen pizza crusts. Expanding foodservice restaurants, especially fast food industry and cafes in GCC, offers a wonderful opportunity for frozen bakery product companies, as it saves time and requires less skilled workforce. Growing E-commerce is another driving platform for the frozen bakery product market, thus providing valuable opportunities to foreign players. Over 75% of the food products originate from import in GCC, mainly from the United States and Europe. Many leading European frozen bakery companies, such as Switz Group, are capturing the market share in the region. GCC consumers have increasing preference for international frozen bakery products. Hot climate in the region, which demands increased shelf life of bakery products, is another factor driving the market. Analysis of the outlook of the market, with the contemporary trends and Porter’s five forces analysis. Market dynamics, which essentially consider the factors that are impelling the present market scenario, along with growth prospects of the market studied over the forecast period. Global-, regional-, and country-level analysis, integrating the demand and supply forces that are influencing the growth of the market. Competitive landscape involving the market share of major players, along with the key strategies adopted for development during the past five years. Three months analyst support, along with a Market Estimate Sheet (in Excel).